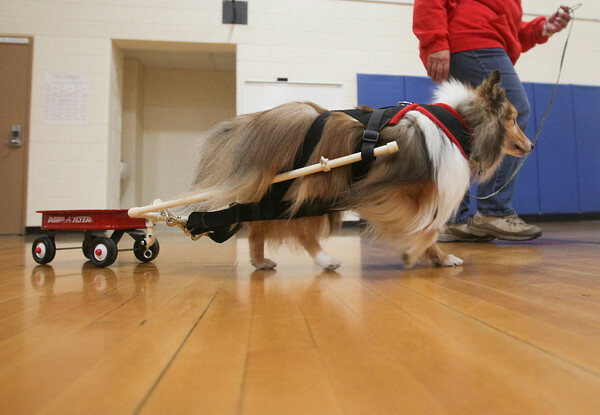 Jane McManus, of South Boardman, owner of Pine Meadows Dog Training Center, demonstrates carting with her Sheltie, Phantom, Saturday, November 2, 2013 during Community Pet Education Day at Mill Creek Elementary School in Williamsburg. The event was a fundraiser for No Unwanted Pets, a coalition between H.A.N.D.D.S to the Rescue and AC PAW with proceeds going for low-cost spaying and neutering. Agility training discussion and presentation as well as topics of pet health and wellness were some of the areas, as well as others, that were covered during the event. Phantom is one of three Shelties in the United States and Canada to have a carting title.